Why store paints inside a flammable storage paint locker by US Chemical Storage? Paints contain many chemicals including metals and solvents that can be dangerous to human health or the environment if stored or disposed of improperly. Storing paints inside a flammable storage paint locker can protect flammable liquids against flash fire, prevent paint containers from building excessive internal pressure and contain flammable liquid spills or leaks. Storing paints inside a flammable storage paint locker will give you the ability to organize and increase production by storing your inventory closer to your facilities. Store your paint storage locker inside or nearby your facility with our 4-hour fire-rated construction. Read labels before storing paints in your flammable storage paint locker. Do not mix incompatible paint products in the same storage room – use solid partition walls to segregate chemical classes. Take inventory before storing paints inside your paint storage locker. Ensure proper ventilation systems – depending on situation – use passive ventilation or mechanical ventilation. Store paints in original containers. Use temperature control systems to maintain a safe storage environment inside your flammable storage paint locker. Equip your flammable storage locker with a fire suppression system. Flammable storage paint lockers provide a dry storage atmosphere for safely storing paints and other flammable liquids. 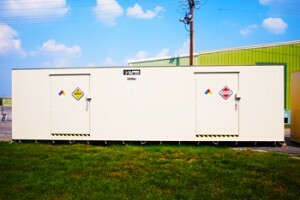 US Chemical Storage flammable storage lockers meet EPA, OSHA, or NFPA regulations and FM or Warnock Hersey approvals. Flammable storage paint locker by US Chemical Storage offers a safe and compliant way to store flammable liquids. Designed for extreme weathering conditions, in order to keep your paint inventory safe in any climate. These paint storage lockers can be used for many different applications including mixing and dispensing flammable liquids. Our compliant lockers are 100% customizable to meet any specific requirement. Optimize your flammable storage paint locker with a wide variety of customizable accessories including heating units, cooling systems, extra doors, fire suppression systems, alarms, interior partition walls, racks, shelving options and more; explosion proof and non-explosion proof accessories are available. Every paint storage locker is hand-welded from heavy-gauge steel and tested before leaving our factory for quality assurance. Designed by professional engineers and custom designed to fit your exact needs. Featuring a 15-year structural warranty and a built-in secondary containment sump to contain chemical spills, leaks or accidents. Gain compliance with US Chemical Storage – Our Strength is Your Security.